Newton Running Shoe Review « Life…as it Relates to Technology. Everyone loves new gadgets. I’ve read several times about how the yellow Spira shoes were banned from the Boston Marathon (internal springs), but it was another yellow shoe that caught my eye (and my wallet). 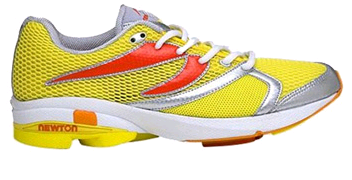 After looking carefully at the shiny yellow Newton Men’s Stability Racer, I decided to purchase a pair ($150) and try them out. I’m a mid level runner and I’ve owned them for about 6 weeks now. First, I visited the Newton website. The website is actually pretty cool and contains a lot of running information, some informative videos and a slew of information on the Newton Running shoes. The one awkward thing was that they have a “Patents” page that doesn’t reference a single patent? (although they claim to have been granted 9…) I found the relevant Newton patent and read the abstract – pretty cool technology they employed with the actuators. Anyway, I immediately let a good triathlete friend of mine try them out for a mile. (“Yes,” we wear the same size shoe.) He came back and said they were “very hard” on his calves, but liked the weight and the “fast feel” of them. The comment about his calves intrigued me so I went back and Googled more information and found the calf strain comments to be a recurring theme. Newton recommends you slowly become accustomed to their shoes. Although the calf comments concerned me, I also found plenty of people who weren’t bothered by them because they were already running correctly. Luckily, I fell into the no-calf-pain camp. I wore the shoes for about a mile the first time out. They felt extremely light, stable and helped my overall body position throughout the run. I felt virtually no residual calf soreness. They make you “feel fast” similar to the way young kids think they can run faster with a new pair of shoes. I started wearing them exclusively and for longer and longer runs. In my case, my body became accustomed to them almost immediately. After a couple runs, I could no longer even tell that I was wearing them. I literally couldn’t feel the lugs in the bottom (strange?). I did consciously try to shorten my gait on a couple occasions. I also stepped it up a bit by speeding up my running cadence which also perhaps forced me a bit more onto my forefoot. I ran as far as 10 miles with them and they were comfortable and supportive throughout. I wore them for a personal best 5k. I don’t know that I can say much in this regard as I was admittedly in much better shape than at previous 5ks. They are very stable and protective for such a light shoe. I also have a pair of Asic Gel Hyper 3′s that I’ll be reviewing. The Asics may be a tad lighter than the Newtons, but they are no where near as protective. I don’t feel comfortable venturing off pavement in the Asics and they are probably best on a track surface. You can always get them next year. Life is too short. Buy the shoes. Also, one of the best things about a fancy new pair of shoes is that they increase your enthusiasm for running. I couldn’t wait to put them on and go for a run. I started thinking about running all the time. It was as if I had just running!